Camso is launching its 2018 dirt-to-snow bike conversion system, the Camso DTS 129, for the coming winter riding season. Building on last year’s successful introduction of the system on the market, Camso also sought out feedback from snow bike riders when designing MY18 in order to exceed consumer expectations. 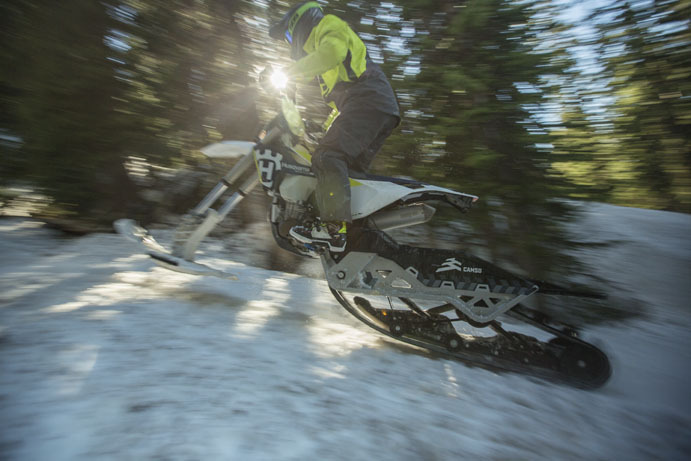 The result is a dirt-to-snow bike conversion system that is more responsive, ensures better handling and gives riders the performance they’ve been looking for. Brake rotor and pad design offer consistent braking and less ice build-up. An industrious accessory has been added to the lineup, a functional wheel kit to easily move the snow bike from the garage to the trailer. A special racetrack conversion kit is also available. The 2018 Camso DTS 129 will be available throughout Camso’s established network of powersports dealers and distributors on September 11, 2017. Attendees to the world’s largest snowmobile and ATV event, Hay Days in Minnesota on September 9 and 10, will be able to get a sneak-peak at booth AD0-AD1, and talk with Camso representatives.